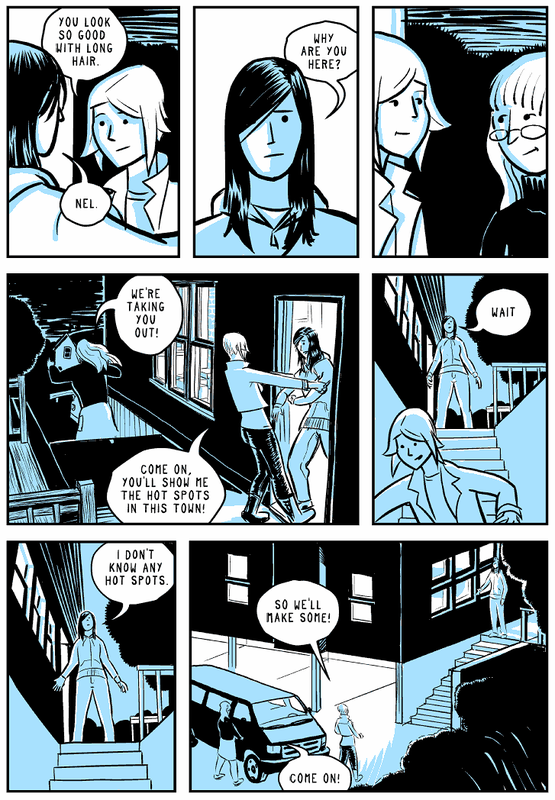 It was sometime during the month of January when Pop Candy posted a link to Matthew Bogart's webcomic, The Chairs' Hiatus. 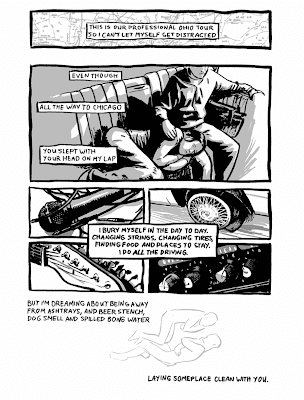 This rock and roll webcomic caught my attention immediately because I love rock music and comics. The story follows the life of Mary Sozer, a has-been rock star who is trying to get her life together following the painful break-up of her band, The Chairs. Mary's recovery period comes to a halt when her former band mate, Nel, comes to visit. I wrote a review of The Chairs' Hiatus and decided to see if Matthew Bogart wanted to do an interview for Champion City Comics. He agreed and I am very thankful. Please enjoy the interview. Matt, please introduce yourself to all the good kids at Champion City Comics. 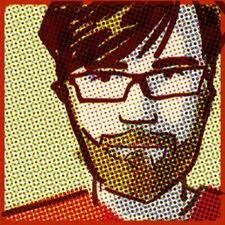 I’m a cartoonist living in Portland Oregon. Last year I published a digital / print graphic novel called The Chairs’ Hiatus (it’s a free read on my website). I’ve been away from comics for a long time and I’m super excited to be making work, and honored by the response that it’s gotten. What artists and writers have inspired you? Anis Mojgani, Joe Besch, and Aaron Krolikowski are my biggest inspirations as of late. All three are friends who do different kinds of work (poetry, painting, and comics respectively). They have been making good work so consistently, with such dedication, I can’t help but be inspired. As far as what I’ve been reading, Jason, Jordan Crane, and Chris Ware have been looming large in my mind recently. Merlin Mann's writing and podcasts also help keep me working. In particular, a talk Merlin gave with John Gruber at South by Southwest a few years ago. The talk was about how to make a successful blog but I think it’s fantastic advice for anyone who wants to work on any creative project. My first exposure to your work as THE CHAIRS’ HIATUS. What was the inspiration for that comic? Strangely enough, the idea for The Chairs’ Hiatus came from the fear that I would never get around to making it. After graduating from art school I’d seen my artistic output steadily drop until I wasn’t creating much of anything at all. Before I started work on The Chairs’ Hiatus I had been effectively away from comics for over seven years. I never decided to give up but effectively I had, and that frightened me. I think this happens to a lot of people. I felt trapped. I knew that if I never went back to comics I would regret it deeply, but I didn’t know how to find a way back in. I had convinced myself I couldn’t make anything of any consequence until the circumstances were right, (the right idea, the right tools, the technical proficiency, the right schedule etc) but the right circumstances never seemed to come. The truth was that I didn’t really need to wait at all. I had convinced myself that I had to wait because I was frightened by the amount of work involved, the sacrifices I would have to make, and the idea that what I ended up making wouldn’t be as good as what I had envisioned. As the years started to pile up I decided I would rather have a finished book that might not live up to my expectations, but that I had learned from, than wait forever for a set of dream circumstances that would allow me to create my ideal comic on the first try. To get the ball rolling, I made myself write every day about whatever moved me. Then I’d try and take whatever came out and bang it into a dramatic story with a beginning, middle and end. Of course, the idea that I identified with the most was of a character who had given up on their art and their subsequent journey back to a creative life! After adding and subtracting elements to make it flow better dramatically, Mary's story ended up being drastically different from my own. The Chairs’ Hiatus isn’t really autobiographical but the original inspiration did come from years of trying to get myself to sit down and make what the book became (which is something I am very proud of). Satellite Beach and Song Comics are also rock and roll inspirations. Do you consider yourself a lost soul of rock and roll? He he. No. I can see why folks might think that but no. I don’t think of myself that way. I do occasionally play music, and years ago, I was in a band that released a couple of albums but music is much more of an occasional hobby for me than something that might lay claim on my soul. I’m sure some little musical details in my comics are drawn from life but I think the main reason music shows up in The Chairs’ Hiatus and Satellite Beach has more to do with needs of the story than rock and roll itself. 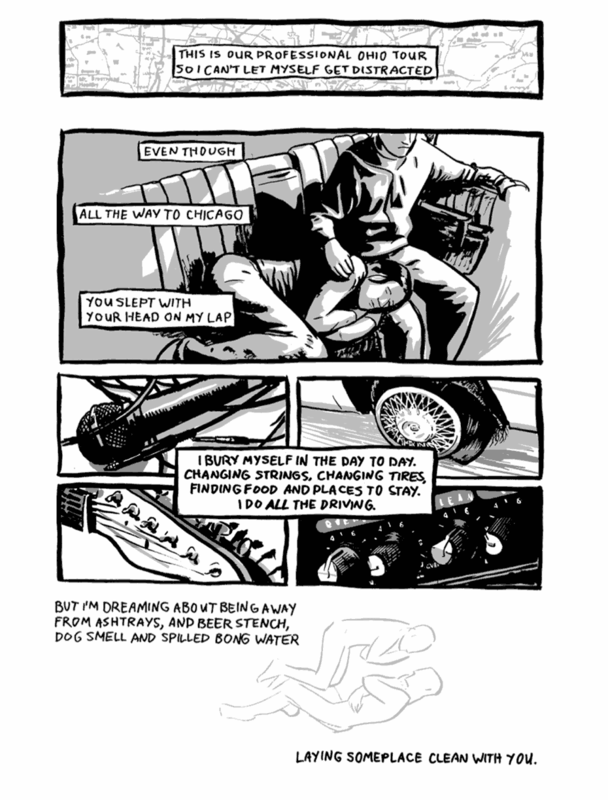 Satellite Beach was drawn as a submission to the 2002 SPX anthology the theme of which was “travel” . The reason it features musicians is because I thought a rock band on tour was a novel take on the theme. The Chairs’ Hiatus is about musicians for a different reason. I knew I wanted to center a story around characters that care about making art, but when you do that you can run the risk of alienating parts of your audience if they don’t care for the art that your characters make. With The Chairs’ Hiatus I decided to make Mary a musician instead of, say, a writer, painter, or cartoonist because it allowed me to show her being creative without ever having to worry about if what she was creating is going to be to the reader's taste. Because comics are soundless, you can just assume that when the characters are playing instruments, they are probably playing music you would enjoy. It’s also, from a visual sense, it's more dynamic to draw someone playing a guitar on stage than writing or drawing at a desk, and from a storytelling standpoint it’s more dramatic when people make art in front of a live audience. Do you have any projects in development at this time? Why yes I do and I am so, SO excited about it! I’m working on my next graphic novel which is tentatively titled Oh. It’s The End of the World. It feels drastically different from The Chairs’ Hiatus to me. It centers around a larger, younger cast of characters, and how they react to the news that the world is coming to an end within the next few months. I’m trying to concentrate on making it exciting, quirky, and funny while occasionally surprising you by being serious and dramatic. It allows me to explore some pretty exciting ideas such as: how morally would you behave if there were no consequences? Is it important to you to feel like a good person? Then you also get to juxtapose that with the question of what would you do if you had a sense of humor and total chaos was not off the table? It’s going to be in full color, which is fun and an exciting challenge. Although I’ve been posting periodic sneak peeks of it on my twitter stream, I’ve decided that I’m not going to publish each page as I finish it as I did with The Chairs’ Hiatus. I’m going to release it in large chapter size chunks. To check out Matthew's work, please visit his main site.